ArtyFartyAnnie: WOYWW #260 - 5th Birthday Party! WooHOO! It's WOYWW's 5th Birthday today and we're doing an ATC swap to celebrate :o) If you haven't a clue what I'm on about, you should really pop over to Julia's Stamping Ground to check it out - you're missing all the fun! WOYWW lets you have a snout around all kinds of workdesks all over the world - they may be organised or messy, pretty or businesslike, productive or "resting", but each one is unique and full of character and creativity. It's fascinating to see what everyone has been doing and have a virtual rummage through their stash - and it's fun to show the world what you've been up to as well. To the right of the pizza box are the two ATCs I managed to make - I know some people have made loads and are swapping all over the place and I wish I had done that, but I just didn't get started in time. I have the one for whoever turns out to be my swap partner when I link up over at Julia's place and the spare one is going to Helen - I love watching Helen's videos on YouTube, she's a very creative lady, so it will be very exciting to get one of her ATCs in the post! Thanks for coming over today - Happy Birthday WOYWWers everywhere, and big thank you to Julia for bringing us all together! I always try and use my scraps up first. It's true...sorting out your scraps really does focus your attention on them...I did that with my fabrics the other day! organized scraps! what a concept! Lots of potential yes, and I feel right at home here with piles and potential. 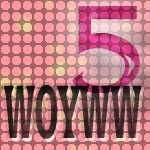 Hi Annie, hope you are having a great WOYWW anniversary week. Taking me ages to get around this week. The thought of your organised scraps is amazing... Long to spend enough time in my craft space to do something similar..... one day!! Thanks for visiting and for your comment. John came home Thursday afternoon - hence the lack of visiting from me until now!! we are adjusting! and I am still trying to visit for last week! Your box of color filed scraps is a great idea. Always good to use up the scraps!